Last year we were looking for an interesting tall perennial that would do well in a fairly sunny and pretty wet place. 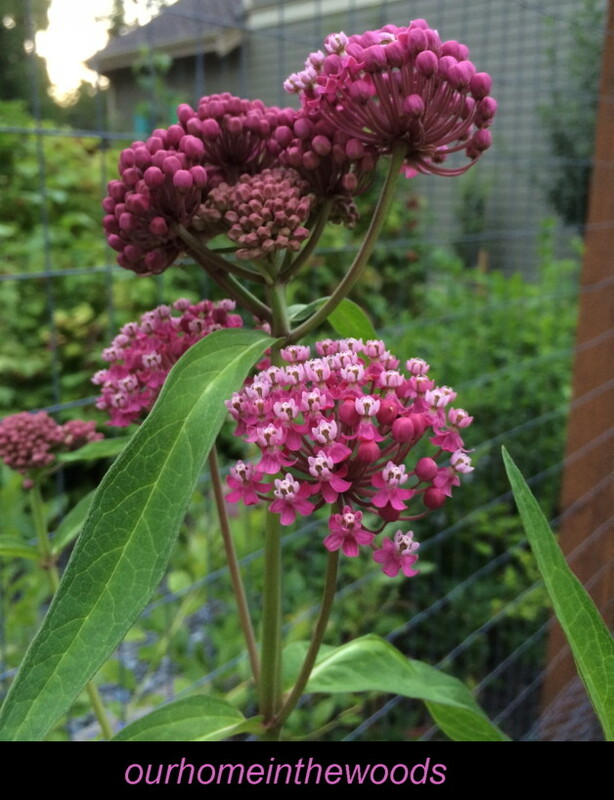 We found an 4 – 5 ft tall herbaceous perennial – Swampy milkweed also known as Asclepias incarnata. 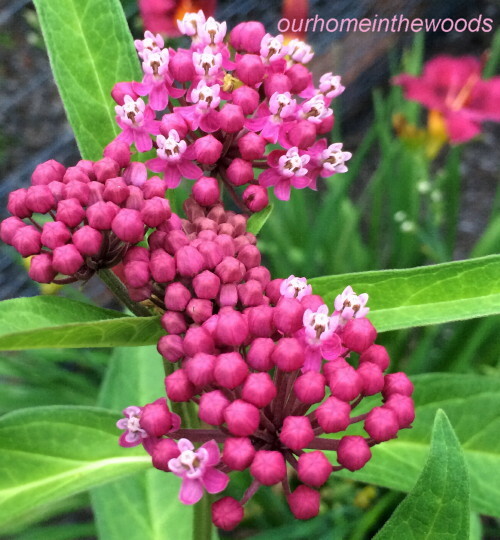 The name Swampy milkweed doesn’t give this plant a very sophisticated aire but it really has some great qualities. It is known as a favorite of butterflies. You can always have more butterflies. 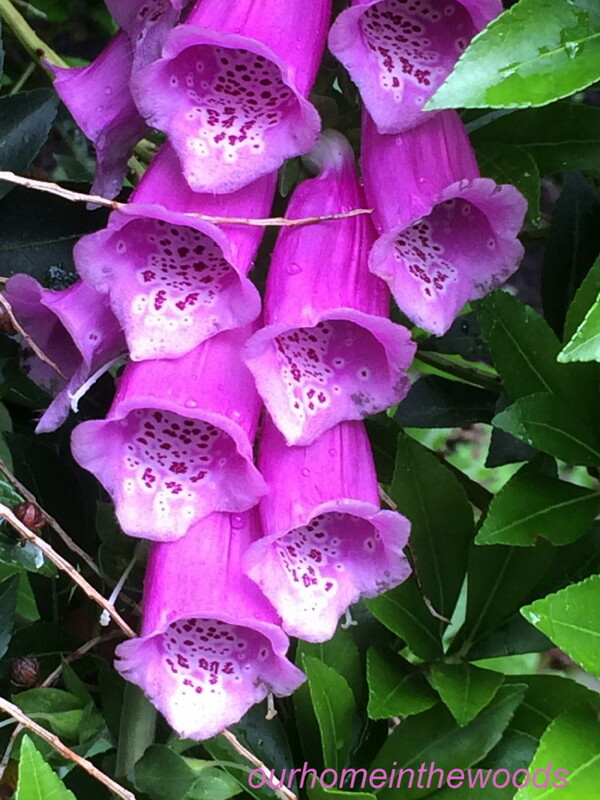 They are attracted to the pretty pink clusters of fragrant flowers that bloom in midsummer. The buds look like clusters of bright pink beads. The leaves are long and slender with veining that looks almost silvery. The leaf arrangement is opposite. Swampy weed grows tall 4 – 5 feet tall and slender eventually becoming a 2 – 3 feet wide clump. A lot of tall and slender perennials get tall and floppy, but the milkweed is self supporting and most of it has remained upright even through some pretty strong wind gusts. Last year we left the seed heads on the plants all season. They dropped onto the ground below and several new plants are growing. I’m leaving them in place and will let the seed heads mature again this year. Hopefully we will milkweed to share next year. 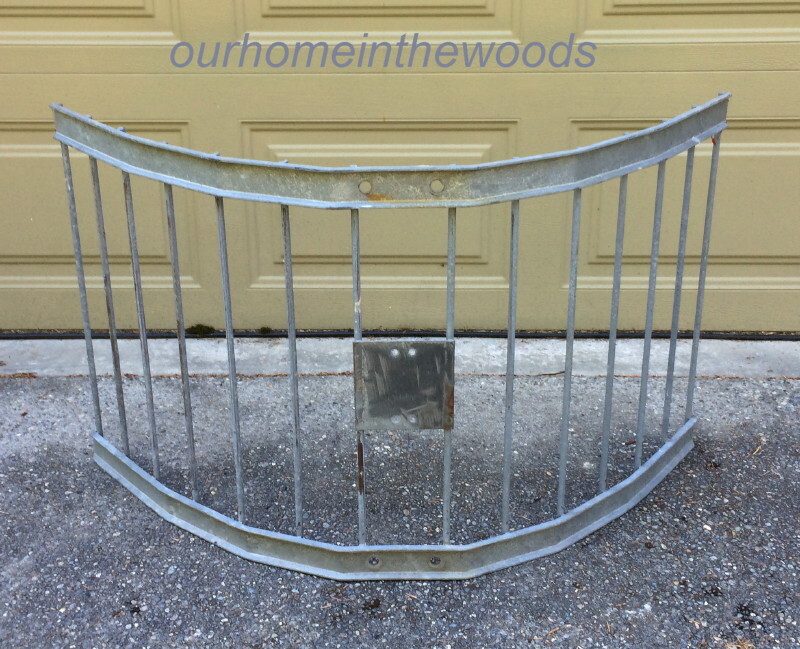 A few weeks ago I stopped at a garage sale and picked up this metal barrier. I was told that it was used as a barrier around a public sign at a park. At the time I wasn’t sure how I would use it or what I would do with it, but I knew it would go in the garden. 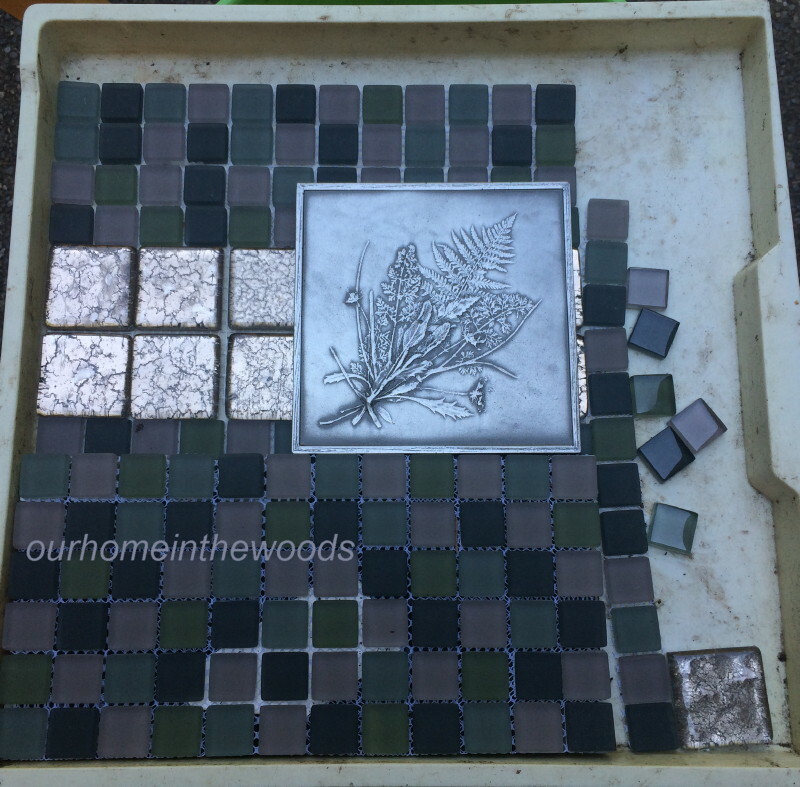 I gathered up some tiles, also picked up at a garage sale for under $2.00 and glued the tiles on the metal barrier with a very strong construction glue. 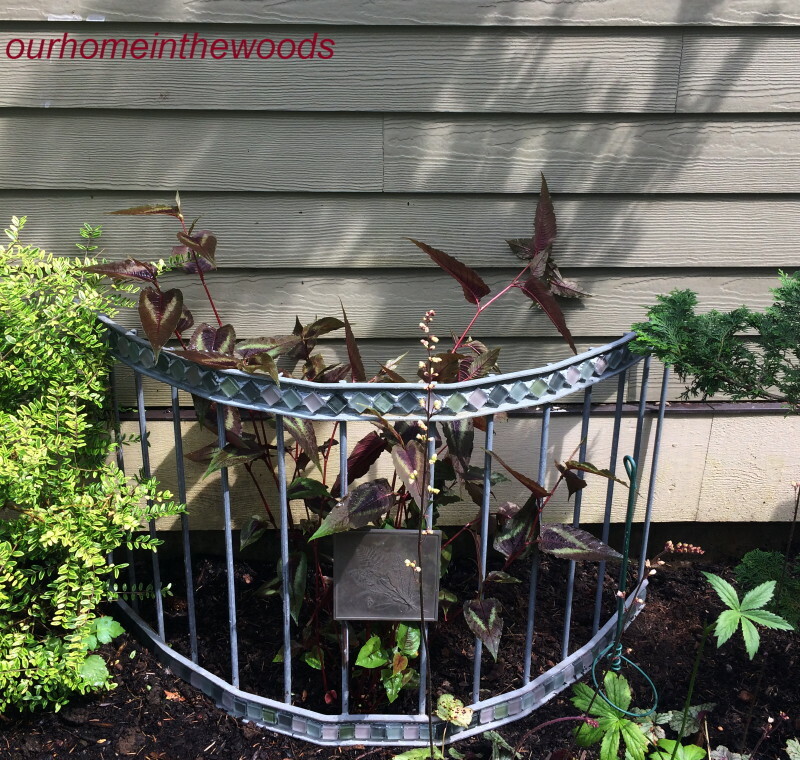 All done… I decided to use it to keep the ‘red dragon’ persicaria from falling over. I have used tomato cages to keep it from falling over before, but I like this better. The red dragon needs to grow into it a bit, but overall a successful garage sale find up cycled into useful garden art for a song. Our ‘amber jubilee’ has been in the garden for about a year now. It’s doing great – growing with beautiful color. Happy & healthy. I was exited at finding this plant last year and adding to our collection of ninebarks. We have 6 varieties now. Usually our ninebarks are at high risk of becoming deer food but things have changed around here. We have added an 85 lb deer repellant named Bailey to our family. He has a very menacing bark and has chased a deer out of the yard several times so far. 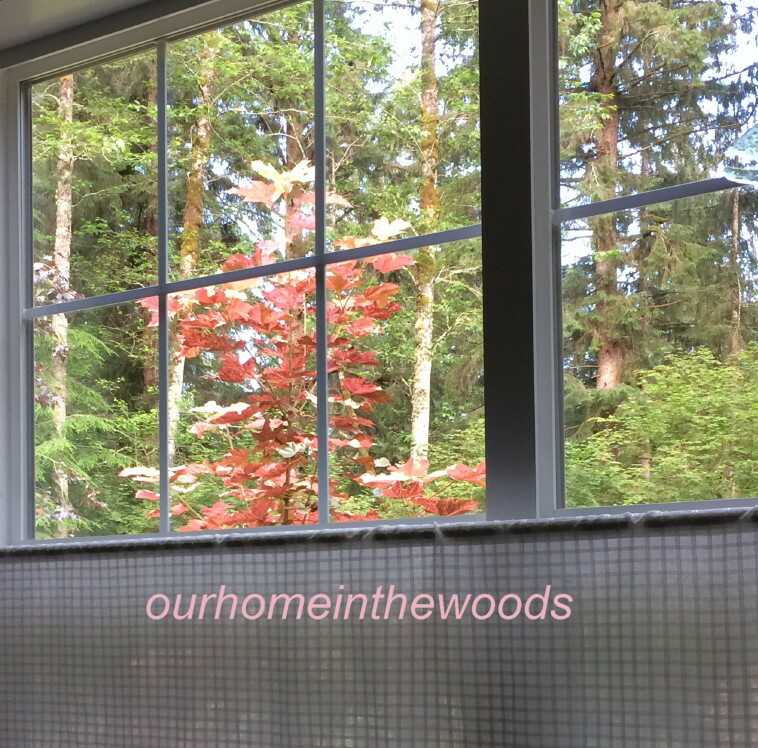 If he sees a deer from the window – he jumps up on the glass and barks loudly. It’s great – he chases them away from in the house. Go Bailey! 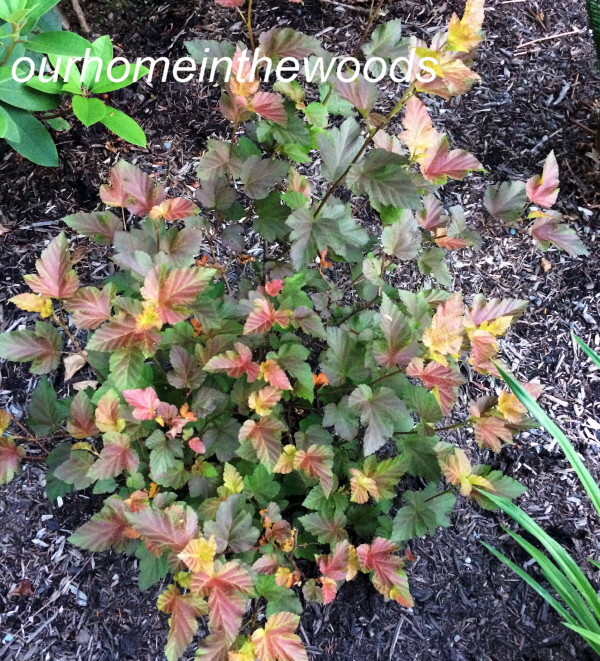 This elegant little (for now) shrub gets bright light all day and only partial sun. It could probably take more sun than it gets but this is where we wanted it in the landscape. I have written other posts about ninebarks. 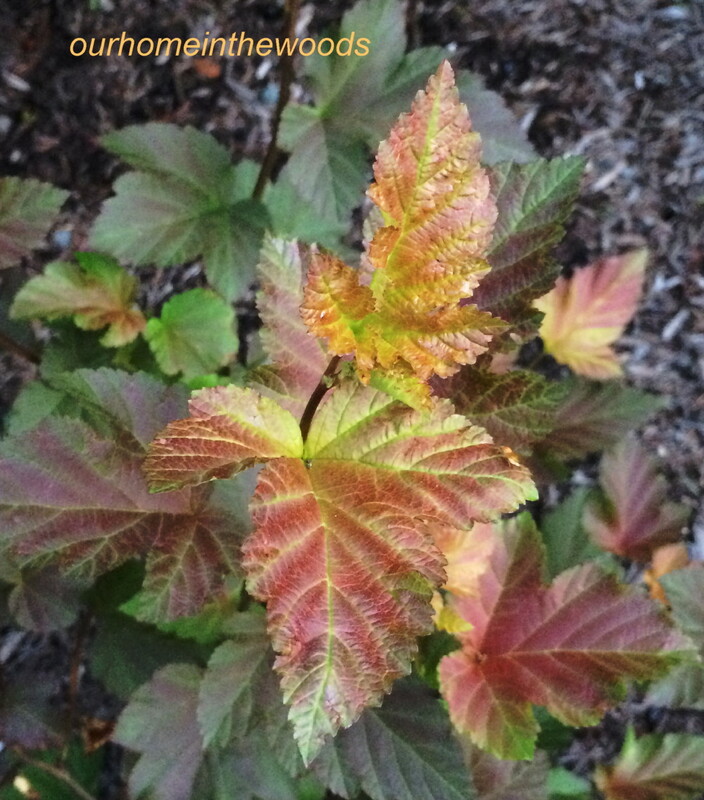 Eskimo Sunset is one the showiest of maples in our yard. 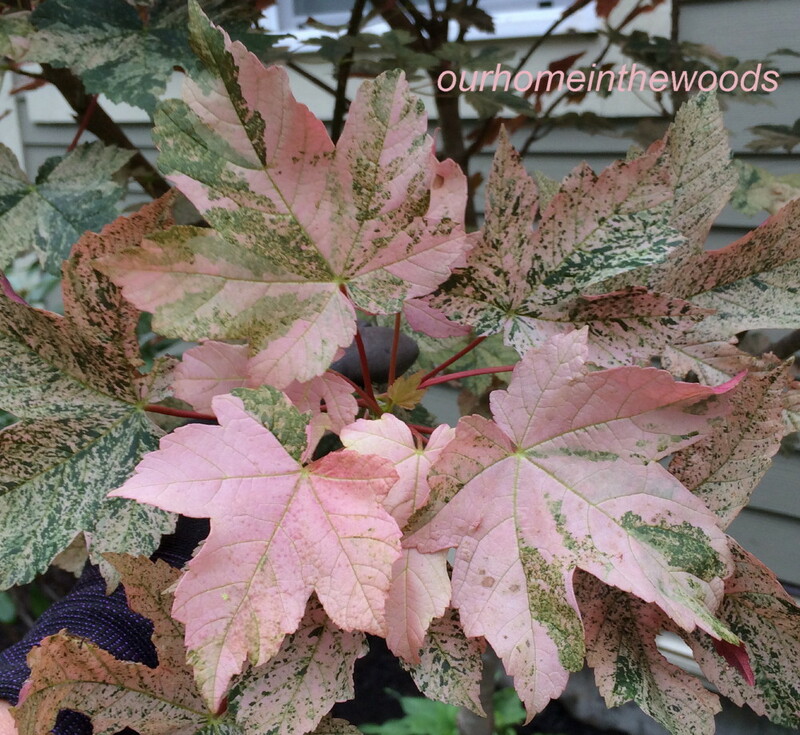 The variations of oranges and pinks in the leaves make this a striking addition to any garden. Ours is planted on the west side right outside our master bathroom. We see it out the window first thing in the morning. What a beautiful sight to start the day. This tree is sure to attract attention. In spring the leaves emerge orange-pink, maturing to assorted shades of greens. 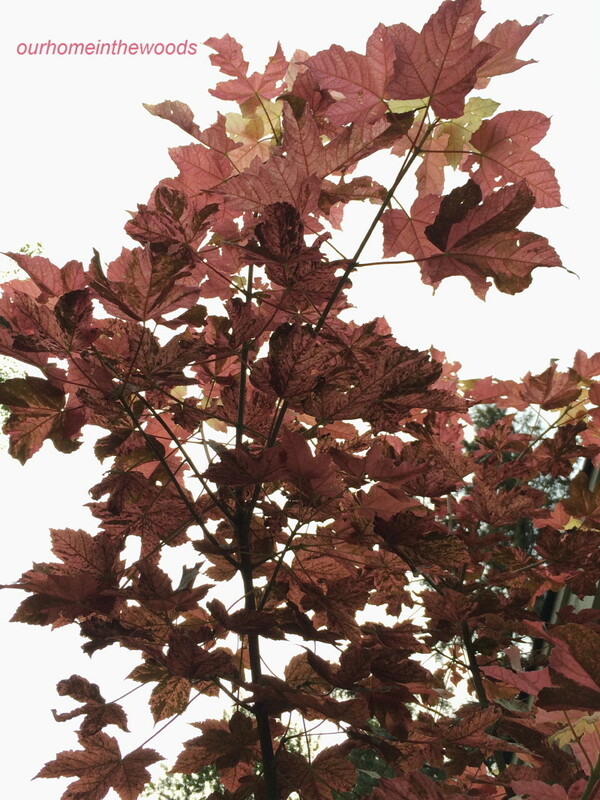 The leaves are marbled, looking as though they have been splashed with creams, tans and pinks. There is a very wide variation among the individual leaves. The undersides of the leaves are purples, adding to the appeal when caught by a gust of wind or you are viewing the tree from below. 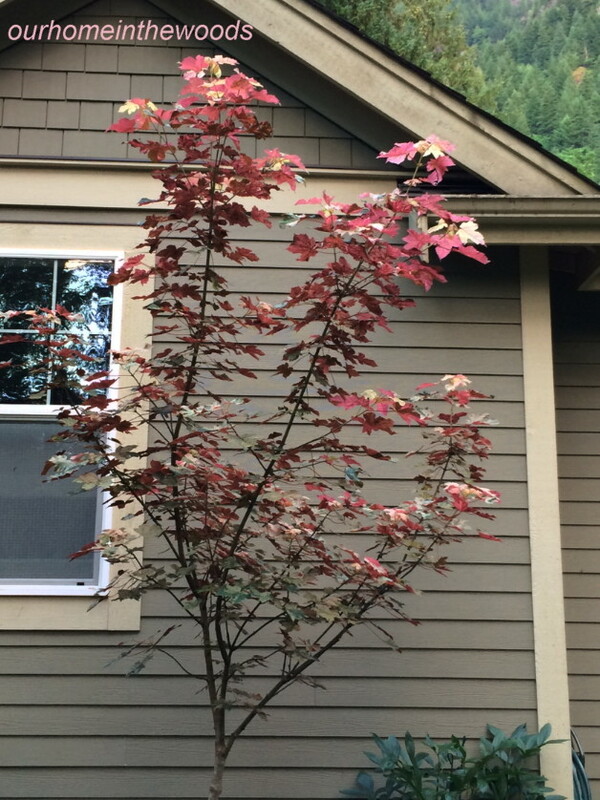 Autumn brings a prolonged color interest from this tree. PRUNING: we have pruned it to improve the shape and for flower arrangements. It has started to grow so fast that I think we will have to be pruning for size before too long. I think they have underestimated the full size and growth rate. It is said that the average landscape size will be12 ft. tall, 10 ft. wide in 10 years; 25 ft. tall with age. I think that is an understatement. I read on another site that it will get to 40 ft.
Eskimo sunset will produce an insignificant chartreuse bloom in mid spring – early summer. Collect seeds by allowing seed heads to dry on plants. Then remove and collect seeds. Seed does not store well so direct sow seeds outdoors in the fall. It was discovered as a chance seedling by John Wills at Trelinoe, his garden in the Esk Valley, which is on the east coast of the North Island of New Zealand. We have had our tree for several years. It was a bit more rare when we found it than it is now. We see them at nurseries occasionally, though it is not a nursery staple in this area. The vibrant leaf color commands lots of attention in this area of the garden. We have just redone the area around this tree and have used plants that add bold foliage colors and textures that are complimentary, actaea simplex ‘black negligee’, astilbe ‘look at me’ peonia ‘Sarah Bernhardt’ and many more. We’re looking forward to seeing all these new plants mature into an interesting, colorful and pleasingly awesome garden anchored by esk sunset. Our garden is at it’s best in the early to mid spring. We have been needing to add summer color and have been focusing on adding plants with foliage interest and summer bloomers. I bought this cute little flowering perennial from Far Reaches Farm, Summer of 2013 for $10.00. I have never seen it for sale anywhere else. 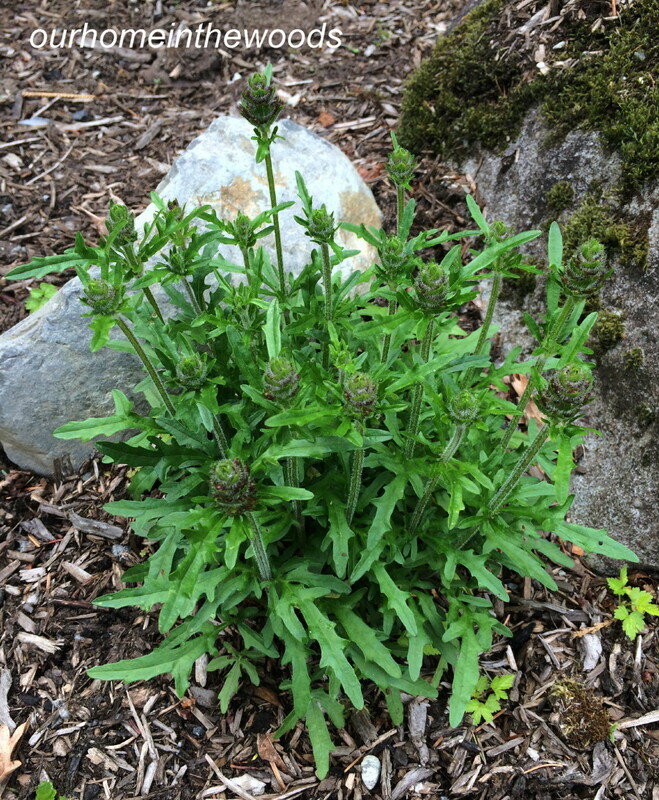 I planted it in partial sun in an area that takes a fair amount of abuse, by the dog chasing his ball, by bunnies, deer and elk all looking for fodder. It sat quietly all winter and sprang back to life this spring and is now in full bloom. The leaves are green and oak shaped. 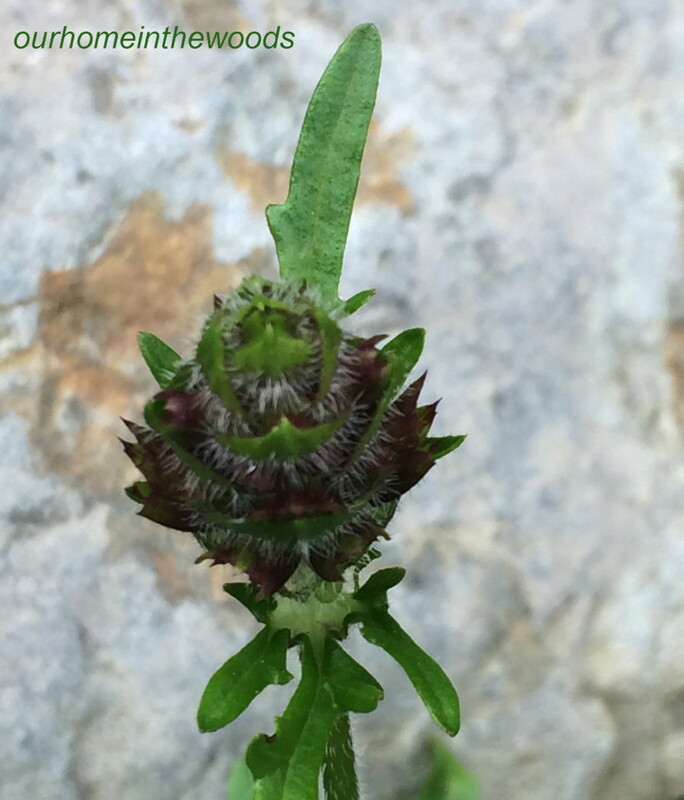 The flower buds are an interesting are odd-shaped affair with a dark burgundy – black whirls with tiny white hairs where the bright pink spikes of hooded blooms will emerge. The buds add an interesting texture to this plant even before the vibrant blooms spring out. The ‘summer daze’ originated In the United Kingdom. 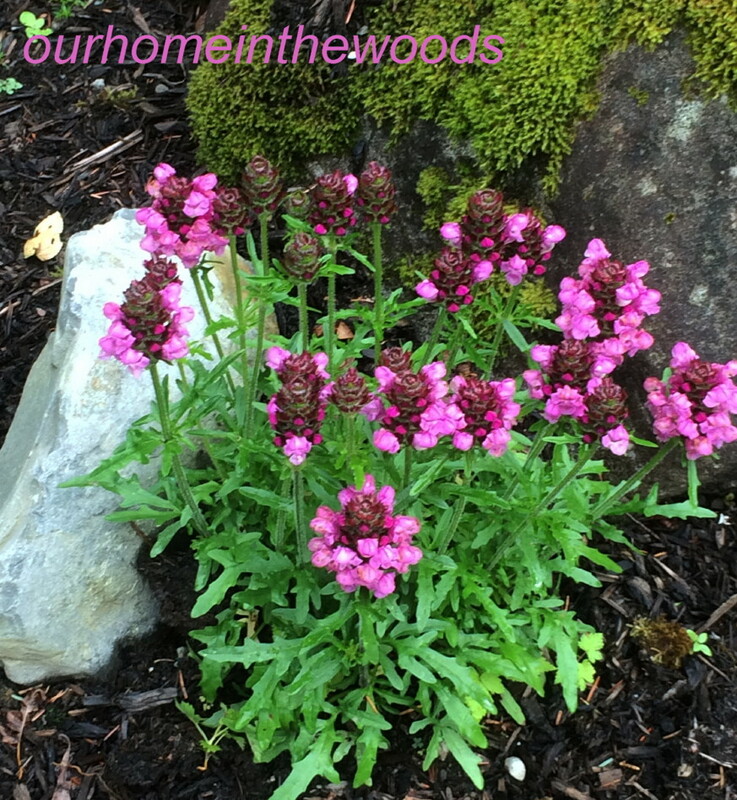 It’s a hybrid herbaceous perennial resulting from the cross between Prunella grandiflora and Prunellalaciniata. It will bloom in from late spring until first frost, producing dense spikes of rosy purple blooms. CULTURE: this plant grows well in sunny or partially shady areas. It also doesn’t seen to be too fussy about watering. It hasn’t received more than anything rainwater since I planted it in summer or 2013. 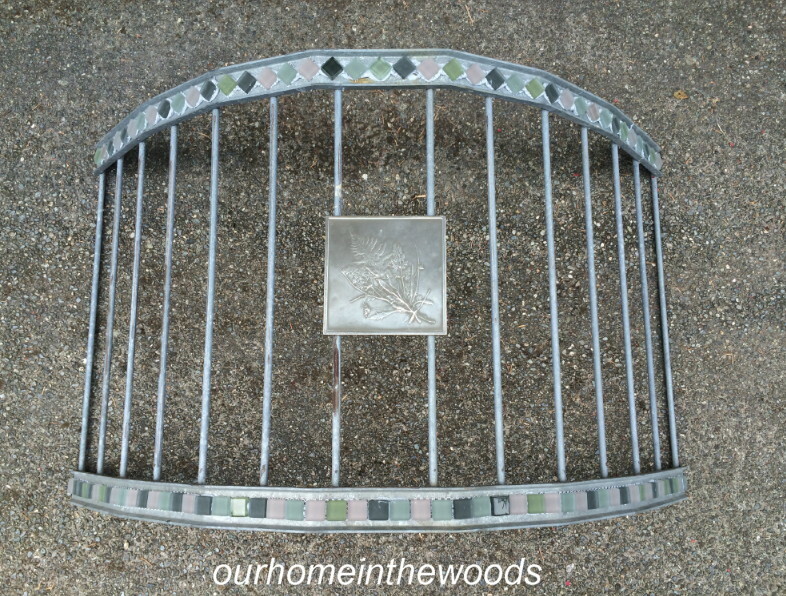 I gave it 1st season protection from animals, by putting a birdcage over it. I don’t know yet if the animal pests will eat it. It is said to be deer ‘resistant’ I’m always a bit skeptical about that claim because the deer and elk that travel our yard don’t seem to read the same ‘deer resistant’ plant charts that I read. ‘Summer daze’ seems pretty sturdy. It clumps neatly and would be suitable in pots or in the garden. Rows of them would be stunning in a border garden! It is said to be hardy to a zone 4 (-30). It had no problem getting through 8 degrees last winter. It can be propagated by tip cuttings however a license is required – I don’t know how easy it is, I haven’t tried it, yet. 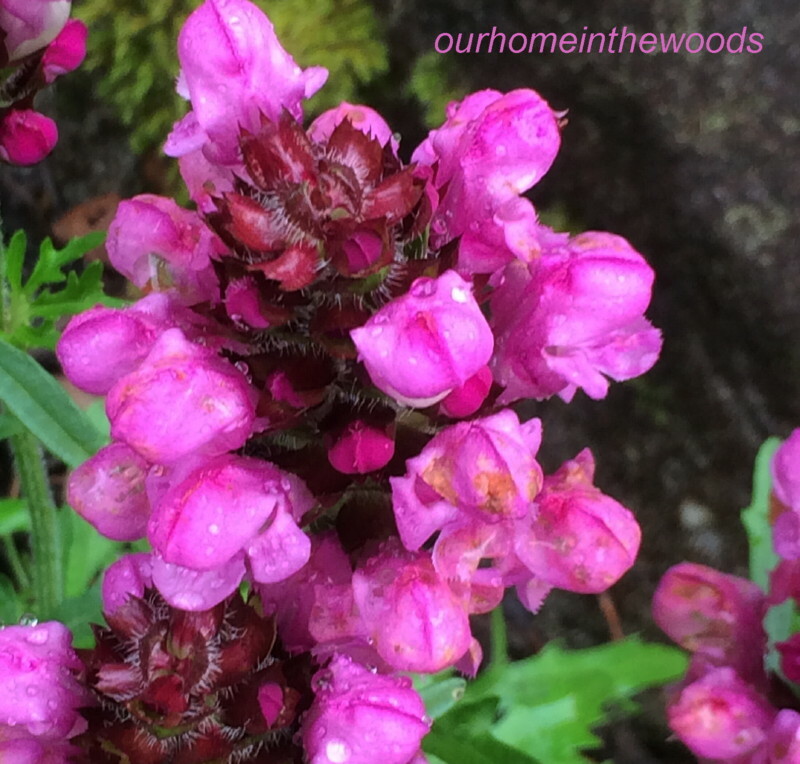 The color of the prunella blooms tie in beautifully with the native digitalis that volunteer in our garden. I think this is a perennial that is definitely worth growing.